If you didn’t know who he was, sitting there in his tan suit, powder-blue shirt and generic baseball cap, you might swear he was your grandpa, ready to go catch the early-bird special. Then he opens his mouth and the words can’t come out fast enough. 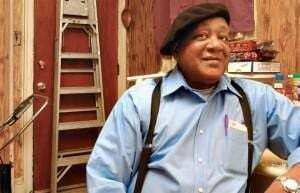 This is Bobby Seale, 71 years old, decades removed from his days as the head of the Black Panther Party. Seale was sitting in a Beverly Hilton ballroom over the summer, helping promote the television premiere of “Chicago 10.” Brett Morgen’s film captures the turmoil in the streets during the 1968 Democratic convention and the subsequent trial that resulted when Seale and seven members of the Youth International Party (the Yippies) were charged with inciting anti-war riots. (The “10” in the film’s title refers to the eight defendants and their two lawyers.) Seale spent part of the trial bound and gagged after demanding to represent himself. Morgen combines actual footage and animation (plus the voice talent of actors such as Mark Ruffalo, Nick Nolte and Roy Scheider performing the court transcripts) to re-create the life and times and trial of David Dellinger, Rennie Davis, Tom Hayden, Abbie Hoffman, Jerry Rubin, John Froines, Lee Weiner and Seale. All were sentenced to some jail time; those sentences ultimately were overturned. In a one-on-one interview, Seale had plenty more to say, including a surprising revelation about his son. NUVO: It strikes me that the Yippies were treating everything as a joke and the Black Panthers didn’t treat anything as a joke. Is that fair to say? Seale: To the Yippies, it was theater, as they called it. To me, it was good theater. I saw more than just a joke. They had this free lifestyle, which is also part of their style of rebellion from the establishment framework. But the fact that the Yippies and whoever else were trying to organize a protest against the war to me was quite serious in the context of all their theater. They had a serious message, but the way they presented it was a joke. Whereas the Panthers had an absolutely serious message. I used to be a standup comedian way before this, so I saw a bit more in what the Yippies and others did in that context. I did a lot of stage acting, jazz drummer too, before the party started. Sometimes party members — like Huey Newton — had very little sense of humor. He writes in his autobiography, he couldn’t stand comedians. Then when he finally heard me do some comedic, satirical stuff, he laughed. But it was in the context of something we were getting ready to protest. I liked what the Yippies were doing. I liked their style of protest. On the other hand, I can say Eldridge Cleaver criticized Martin Luther King too much. He criticized the non-violent protest movement too much. That went against my grain and I disagreed with him. He wanted to go to revolution too fast, too quick. There wasn’t enough to warrant guerrilla-style revolution. I said yes, I would participate in guerrilla revolution against this government — IF it takes away our rights enumerated in the Constitution. Our organization was all power to all the people. We didn’t give a damn whether you was black, white, blue, red, green, yellow, polka-dot. We want to know where your heart, mind and soul is at. The majority of the Black Panther Party followed my program. My program was programmatic organizing — putting up programs in the community. Serving the people, uniting them, getting them registered to vote, etc. And running them for political office — the idea being that if you get elected to political office, you can change a lot of basic laws and rules that perpetuate institutionalized racism. That was my concept of the real revolution, OK? In the interim, we got into shootouts. Why? Because the FBI, the police, came to our offices to attack us. We had the right to defend ourselves. We would take the arrests. And they knew this. In the early days, they always knew if there were arrests, we’d take the arrests. We’re not scared in the courtroom. We’d go to court, and we won 95 percent of all our cases. Later, when 1969 roles around, three years later, with J. Edgar Hoover and them, they came in shooting. There wasn’t “come out, you’re under arrest.” They just came in shooting. That meant they were trying to terrorize us out of existence. So that shootout in L.A., Dec. 6, 1969, lasted almost five hours. Eight men and eight females and they all survived. And they had 300 SWAT team men right there in East Los Angeles. NUVO: Do you think that between the Yippies and the Black Panthers, you were just scaring the hell out of white America? Seale: (Laughing) Well, I don’t know. I think the FBI, the counterintelligence program, contributed largely to this stuff. You could read some of the old Freedom of Information Act documents about the counterintelligence program against the Black Panther Party. What you’d find out is examples like “Bobby Seale fornicates with several different women in the Black Panther Party,” after I separated. “The Black Panthers hate all white folks.” They’re saying this right in the middle of our coalition politics where we had face-to-face relationships every day with our white friends. NUVO: The little I remember was that people had the impression that the Black Panthers hated white America. Seale: What I’m trying to explain to you is, the COINTELPRO [the FBI Counter Intelligence Program, created to investigate and disrupt political dissident groups] sent their press releases to the press and the politicians’ offices. So in the middle of 1968, Mayor Daley is on television [imitating Daly]: “The only reason the Black Panthers have guns is to come into the white community and shoot and kill white people.” Quote-unquote, this man says this. Give me a break. And we were running up and down the street with all our white radical buddies here, in Chicago and everywhere. What was really scaring the people was politicians taking the FBI’s lead on the negative and stereotyping us. The [Panthers’] breakfast program [for the poor] is positive. The free, preventive medical health clinics are positive. The sickle cell anemia testing programs are positive. These are all positive things. And J. Edgar Hoover literally gets up and says the breakfast program is a threat to the internal security of America, it is communist-inspired. And this is second time this man is calling my organization a threat to the internal security of America. The first time he did it was in December 1968. The second time he did it was close to April 1969. NUVO: What are the lessons people should take from the ’60s? Seale: To me, the right to assemble, to protest, to march, to demonstrate is a First Amendment right. Take the lesson that when the system bogs down in any fascist way, whether it be mild-mannered fascism or overt, you’ve got a right to protest and redress. You’ve got a right to assemble. You’ve got a right to talk to and educate people, help raise their consciousness. This is important. NUVO: Has the second part of your life been more productive than the first? Seale: (Laughing) The first part, those 12 years I was in the struggle, from spring semester 1962 to July 1974 when I resigned from the Black Panther Party, those were some hectic years. I quit my job at Cox Aerospace and Electronics. I worked in the engineering department out there on the Gemini missile program. I had placed myself in the high-tech world that I loved. I was part-time student at Merritt College as an engineering design major. I worked a full-time job for three years. That’s when I got interested in the struggle. Ultimately, after [President] Kennedy was killed, I quit my job. I wanted to work in the grass-roots community. It was later that we created the Black Panther Party; we created the Black Panther Party in 1966. I took on another career at that point — dealing in protesting and trying to organize programs and opposition to institutionalized racism in America. The Black Panther Party, as a political revolutionary-style organization, was one of the most relevant things I could cause to happen. I got out there and tried to do what I could. Indirectly and directly, I caused a lot of things to happen. NUVO: We have a war now that’s similar to the one you protested. But you don’t see the people on the streets protesting. Does that bother you? Seale: There’s no draft. That’s half the reason. No, it doesn’t necessarily bother me. I think we have some degree of protest sentiment about wanting the war to end and they’re trying to go through the existing political process. It’s largely centered around that it’s Bush’s war and he’s still president. He ignored the pleas to cut down, scale back or do whatever. He’s got an 18-month tour, I think. NUVO: Your son knows who you are, right? Seale: I never objected to him, in the early days, being in the military. A lot of guys join the National Guard so they can have some income and help people in floods and things. That was cool. I was in the military. Even though I was kicked out, I liked the military. NUVO: One of the other trials you were involved in was the murder of Alex Rackley. [In 1970, Seale was accused of ordering the murder of Rackley, a Black Panther who was thought to be a police informant. The jury failed to reach a unanimous verdict — it was 11-1 in Seale’s favor. The prosecution decided not to retry the case.] Do you know what happened to him? Seale: George Sams killed him. That was the testimony in the court trial. That’s what happened. Then George Sams ran and the FBI got George Sams to lie and say I told him to do that. I didn’t tell him to do that. I basically won the case, although it was a hung jury. Before the hung jury came down, I was actually found not guilty by all 12 jurors. Ericka Huggins was being tried with me. Then they started deliberating on Ericka Huggins for five days. Then one of the jurors wanted her convicted so bad of the lowliest, unrelated charge of so-called blackmail. They got totally away from any murder on her part, convicted her of this because she was there in the house. The rest of the 11 jurors did not want to do it. And she rescinded her not-guilty vote for me. NUVO: So you had nothing to do with the murder? Seale. No. No. No, no, no, no, no, no, no way. My point is, why did the FBI, when we requested arrest records from the FBI in Canada of George Sams, why did they come in with their attorneys and get the judge to seal the records in the name of national security? I believe they coached him to say I ordered the murder.